Retlif Ronkonkoma recently was host to Mr. Ben Monachino, Congressional Aide U.S. House of Representatives, from Congressman Lee M. Zeldin’s office. Retlif’s Owen Watford and Bill Hayes hosted Mr. Monachino on tours of both the Retlif EMC/EMI Laboratory and the Environmental Lab. They provided expert opinions about current U.S. Department of Defense legislation in Washington DC from an independent laboratory perspective. 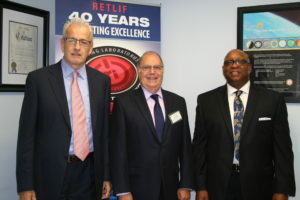 Left to right: Retlif Executive Vice President, Congressional Aide Ben Monachino, Retlif Business Development Manager Owen Watford after completing their tour of Retlif Ronkonkoma.